Node memory leaks happen. Usually they occur in production where processes experience the weight of their purpose and a mandate for uptime. Thankfully, the core of Node is becoming more and more resilient to leaks. However, between our code and the modules we include, leaks still happen and it’s good to be prepared to handle them. These may not be the tools you are looking for. If you observed closely at the top output above, you may have noticed I cheated. My app has barely been running; however, it is taking up a lot of memory already. If you have an app where memory leaks can be duplicated, use tools like node-webkit-agent or node-inspector locally to help pinpoint the problem. Snapshots are written to your current working directory with a timestamp like heapdump-179641052.37605.heapsnapshot. There will also be xxxx_.log_ of the same name written containing stats about the heap when the snapshot was taken. Unfortunately, not all memory leaks are created equal. Some are slow leaks that can take hours or even days to build. Some happen on under-utilized code paths. Some are constant. So when should you take a snapshot? The answer: it depends. It’s good to have a baseline snapshot to compare memory usage. You may want to generate a snapshot after your application is up and running for a few minutes. If you are running a UNIX server, send a SIGUSR2 to the process to record the snapshot. As you notice the memory usage increase, repeat the process to gather more data for analysis later. Whenever you take a heap snapshot, V8 will perform a GC prior to taking the snapshot to give you an accurate picture of what is sticking around in your process. So don’t be surprised if you notice your memory usage drop after taking a snapshot. Write a snapshot to the current working directory every half hour. Taking a snapshot is not free. It will peg a CPU until the snapshot is written. The larger the heap, the longer it takes. On UNIX, snapshots are written in a forked process asynchronously (Windows will block). Whenever we breach the nextMBThreshold, write a snapshot and increment the threshold by 100 MB. Once you have collected two or more snapshots representing the change in memory, it is time to analyze the data. Copy the snapshots to your local machine, load the snapshots into Chrome Dev Tools and start analyzing! I find the Comparison view helpful. Unfortunately, Comparison hasn’t worked for imported snapshots. However, this bug has recently been fixed (see bug ticket)! 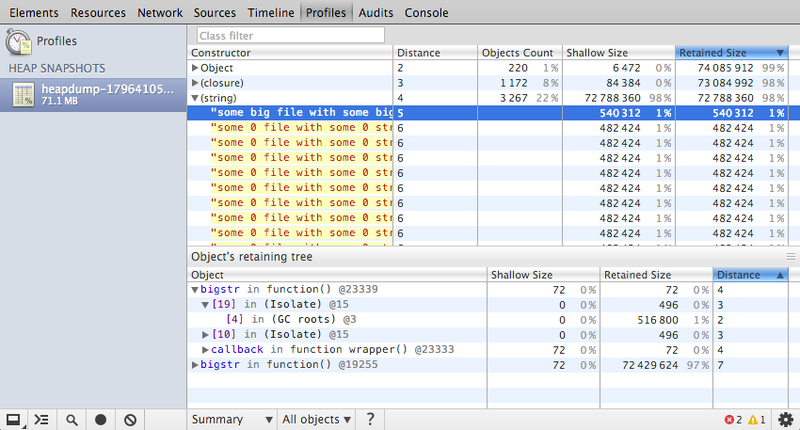 For more detail on the purpose for the Comparison view and the other views, see the heap profiling documentation. Load snapshots into Chrome and take a peak at what is currently stored in your application. Any surprises? Memory leaks can happen and thankfully we don’t have tackle them blindly. In this article, we focused on the heapdump module. 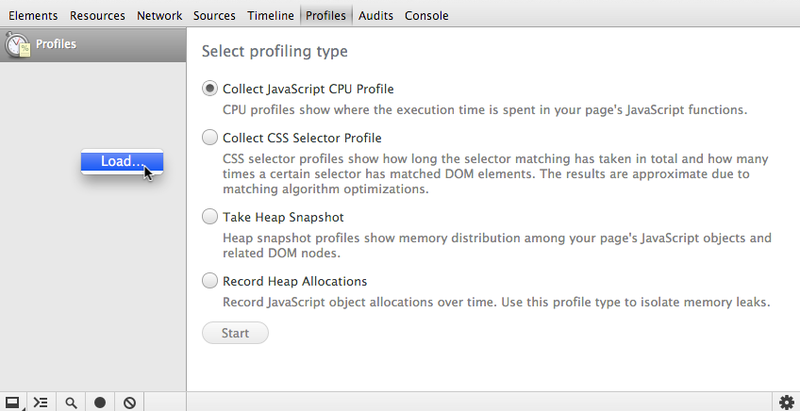 We looked at the process of instrumenting our application, taking heap snapshots, loading them into Chrome Dev Tools. We then looked at strategies for getting useful data to analyze. Lastly, we covered some resources for analysis using Dev Tools.